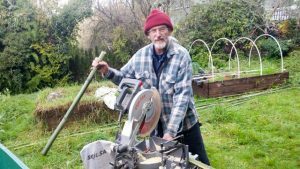 This fence method, as a permaculture practice (permanent + agriculture ,first known use 1978) has been embraced by Meadowbrook Community Gardens and Orchards (MCGO) as a way to use resources that are local, sustainable and renewable. 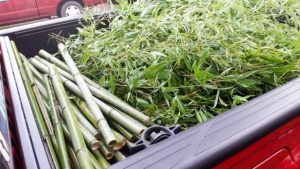 In the Meadowbrook community of NE Seattle, an MCGO volunteer has a bamboo patch on their property that donated materials to the most recent effort. 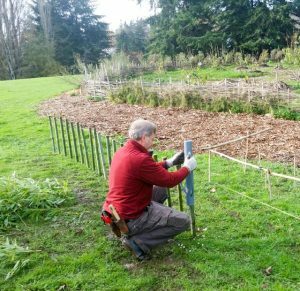 The call to ‘wattle’ was to protect newly planted Camassia quamash bulbs (blue camas) patch near the Fig Orchard at MCGO. 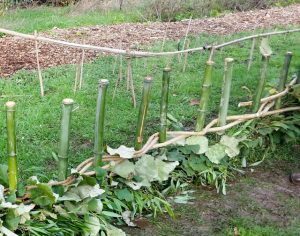 Harvesting, cutting to size, transporting and building this protective wall all took place on one early Winter day in 2016. Not a tall structure but it does repel the bouncing ball, wayward dog or anyone randomly walking through the dedicated and approved space. Near the Fig Orchard, it is also located near the 2015 planting of willows. A very wet space in the Fall, Winter and Spring, the plan is to create usable and serviceable space. Willow, which is a very water friendly tree, can also be harvested for basket weaving once established. 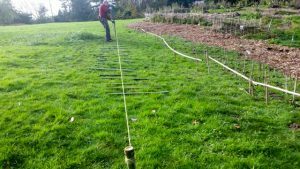 As a display, this agricultural method of fencing integrates human activity with natural surroundings, thus creating and supporting highly efficient self sustaining ecosystem. 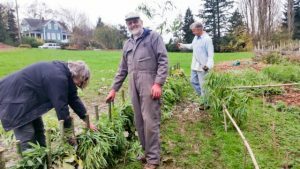 The one day project had the support of MCGO, which manages the Seattle Parks space, with support from the Meadowbrook Community Center Advisory Council and the Lead Gardener with Seattle Parks. The delineation of the space also supports the lessening of the use of fossil fuels (cutting grass). It also frees up Seattle Parks to apply resources to other parts of the Park System. As an educational resource, more who visit and take home their knowledge and apply urban forest gardens in their own space makes us all stronger and connected. Good work, MCGO.